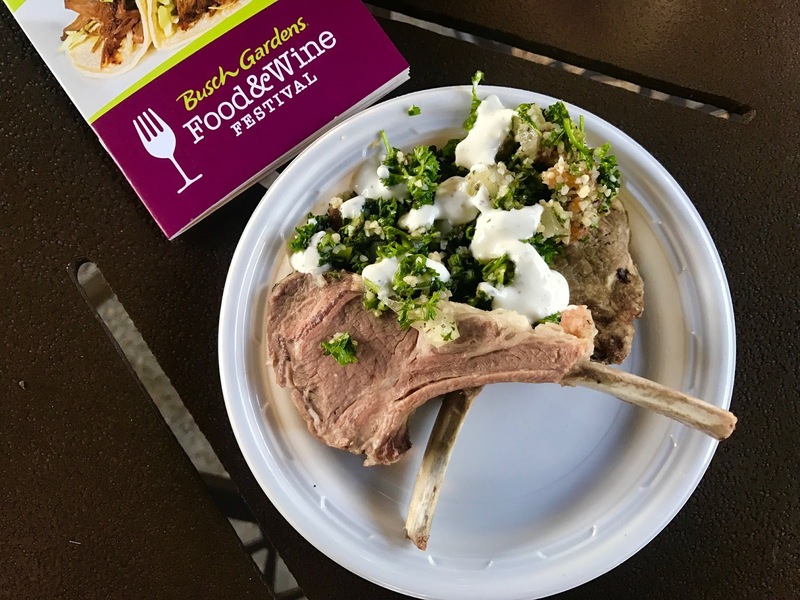 This weekend kicked off the third annual Busch Gardens Food and Wine Festival in Tampa Bay. The festival will take place on Saturdays & Sundays March 4th through April 30th and feature 13 food cabins, 65+ fine wines and 70+ craft beers. Along with delicious food, wine and beer, Busch Gardens offers live concerts at 7 p.m. This is included with any Pass, Fun Card or daily admission to the park. Some of the live acts include DNCE, Hunter Hayes, The Band Perry, Goo Goo Dolls and Lynard Skynard. Click here for the full concert listing. We ran into many fellow bloggers and media folks at the VIP festival. As always, we were happy to spend time with our friends and neighbors Heather & Bobby. This was their first visit to Busch Gardens an we are now working on a date to come back and experience more of the festival! This is a perfect time to take advantage of the Busch Gardens Fun Pass - where you pay for a day ($102.99) and get to come back for the rest of 2017 for free (including Adventure Island). This allows access to the following special events: Busch Gardens Tampa Bay's Real Music Series, Food & Wine Festival, Summer Nights and Christmas Town™, plus Adventure Island's Island Nights. As I mentioned above, there are 13 themed food cabins with a variety of different small plates for purchase. We tried a variety of the dishes served during the multi-weekend festival. My favorite without a doubt was the Tuna Poke Wakame Salad from Garden Gate Cafe. I was very impressed with the Lamb Chops from Field House Eatery. The Tabouleh and Tzatziki were a perfect addition to this dish. 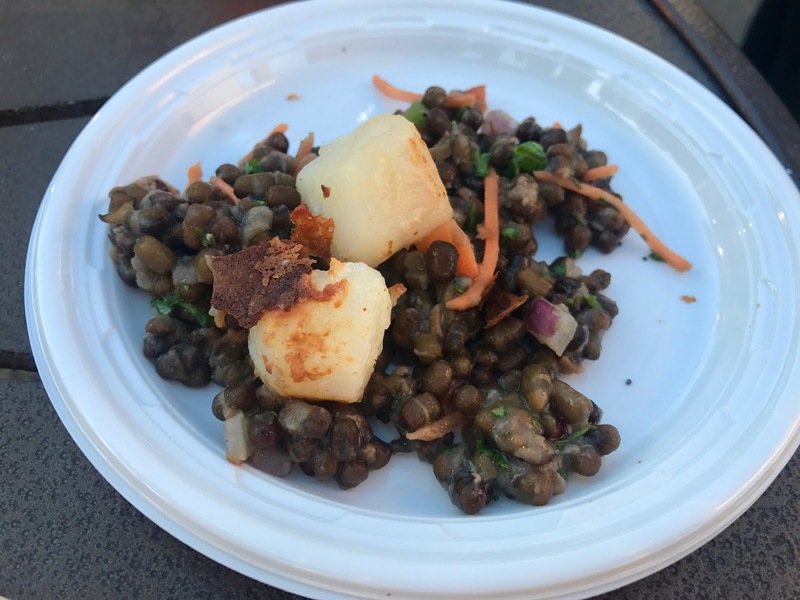 You can also find Pan Seared Scallops and Black Lentil Salad at Field House Eatery. The dessert offering at Field House Eatery was a Key Lime Berry Parfait Mousse with a Churro! The Pulled Pork Slider with Cherry Coke BBQ from the Cooking with Coke Pavilion was another crowd favorite. This tent also features Baked Brie with Strawberry Fanta Syrup and a Coke-Infused Chocolate Pop Rocks Cupcake - both of which I will be back for. 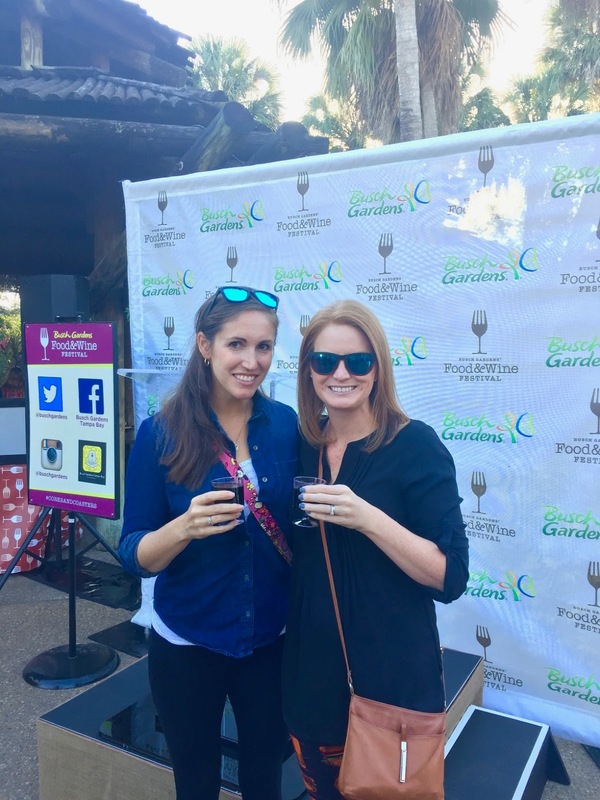 Along with a sampling of dishes from the festival, we also tried multiple varieties of wine, craft beer, frozen sangria and a bourbon tasting. Check out the menu's below! Explore the exotic flavors of Gourmet Lodge, featuring a new mango shrimp ceviche, and smoked beef brisket on a spiced corn waffle. Our 2016 guest-voted favorite, the griddled cheese cake sandwich, will also be returning. Tempt taste buds with the rich flavors of Savory Tavern, including coconut shrimp cigars, cabernet wine-filled chocolate truffles, and a goat cheese polenta cake topped with olives and tomatoes. Hearty flavors await your palate at Chef’s Plantation with pan-seared salmon, Korean-style ribs and brown sugar-rubbed pork belly. Classic Latin cuisine and a delectable dessert favorite come together at Coast to Coast Cookery, featuring Chimichurri hangar steak, all-new vegetable arepas and a flourless chocolate torte. 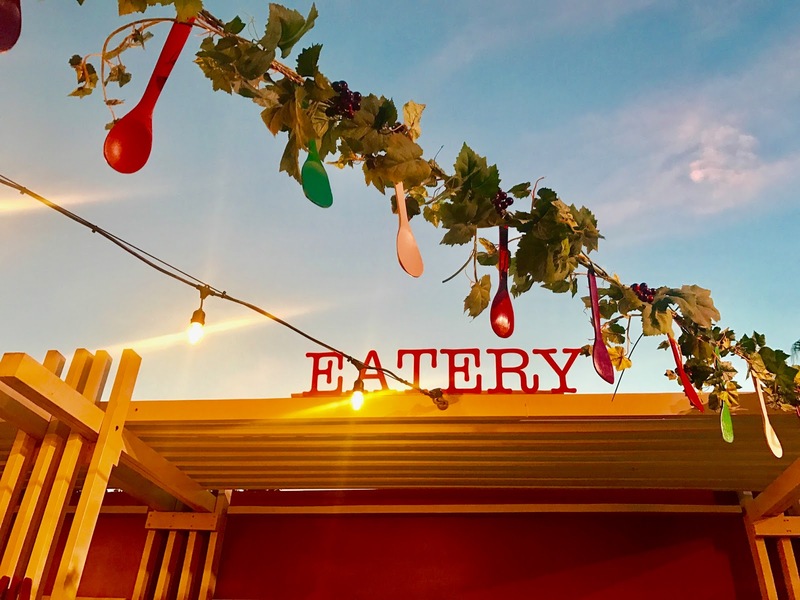 The Field House Eatery is the Festival’s biggest location, offering pan-seared diver scallops and lamb chops with tabouleh and tzatziki sauce, plus a new-for-2017 key lime berry parfait mousse. Southern Station tantalizes taste buds with all-new venison meatloaf and bananas foster panna cotta, along with a returning favorite, the bison slider. The Comfort Kitchen fuses classics like our famous bacon mac & cheese and buffalo chicken mac & cheese with contemporary elegant eats like lobster ravioli in a delicious tomato sauce. Freshen up your palate at Light Fare Canteen with the all-new lobster tart with spring asparagus. Then, fill up on returning favorites like smoked chicken quinoa and a perfect cheese plate to accompany a glass of wine. The all-new cabin puts a twist on the classic taqueria with a BBQ short rib taco, Portobello mushroom taco and the sweet chili duck taco. Garden Gate Café brings back two favorites with tuna poke, and a pheasant sausage flatbread topped with filet de pomodoro. Treat yourself to unique flavors crafted to treat your appetite, including shrimp and grits and a toy box tomato salad. Savor the flavor at the new Cooking with Coke® Pavillion where Coca-Cola® inspired creations come to life, including pulled pork sliders with Coca-Cola® Cherry BBQ sauce, baked brie with Fanta® Strawberry syrup and a Coca-Cola® infused pop rock cupcake. Indulgent guilty pleasures come to life at the all-new Coke Fusion Presented By Coca-Cola®. Enjoy delicious ice cream floats, jerk chicken empanada with Coca-Cola® inspired dipping sauces and chili pepper southwest cheddar soup.